Think big, think bold, think patterns, think contrast. There’s nothing shy or retiring about this look, but careful styling and clever contrasting is essential to avoid it becoming cluttered. It’s all about the contrast not the clash – layering elements that work to support and elevate the other, not fight for the limelight. Our stunning Sienna range is the perfect collection to style against a big and bold feature wall as it offers a beautiful neutrality laced with intricate and considered design. Creating a feature wall can totally transform your bedroom and the furniture within it, so this is the place to start. Once you’ve chosen your wallpaper, pick out two or three colours in the pattern you’d like to style out across the room. We’ve chosen to accent mossy greens and caviar blues, but of course, it’s personal preference and there are a multitude of colours you could choose. 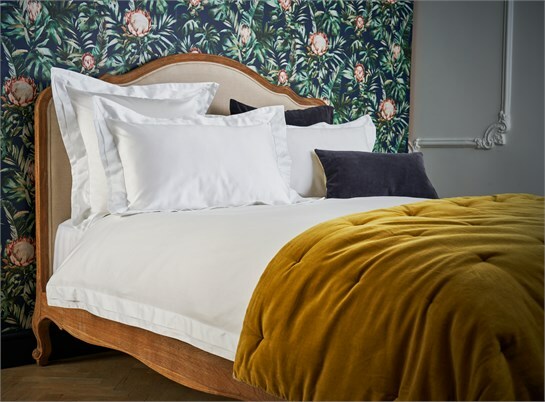 Our stylish Sienna Natural Bed provides a stunning silhouette against our feature wall – the elegantly fluid design and cabriole legs mimic the curve of the leaves in the wallpaper, and the contrast comes with the weathered oak wood and clean, upholstered linen headboard. Our sumptuous Antique Moss Velvet Throw accents the feature wall beautifully, providing warmth, luxury and a bold layer of colour. The elegant, French inspired design of our Sienna 5 Drawer Chest is amplified when set against our feature wall. 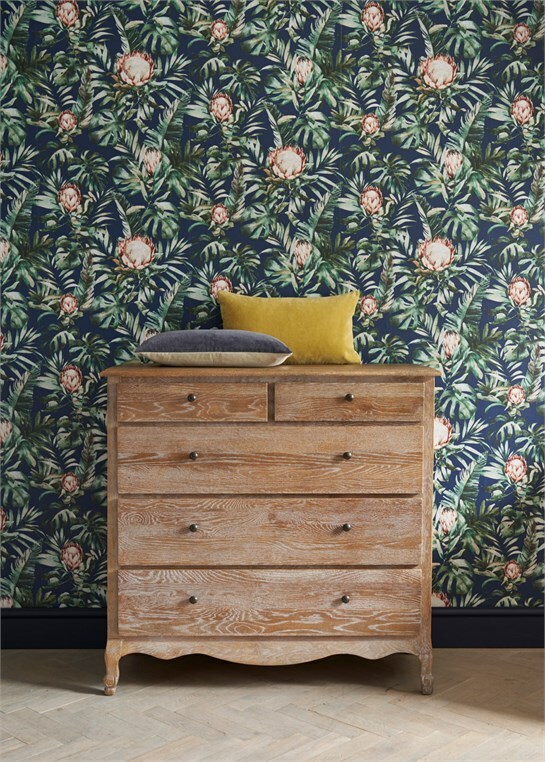 There’s a certain symmetry between weathered oak furniture set against floral wallpaper that we love. It stands out and stands alone perfectly happily. Our Velvet Cushions in Antique Moss and Caviar blend and pop against the feature wall – a lovely hit of colour and texture. 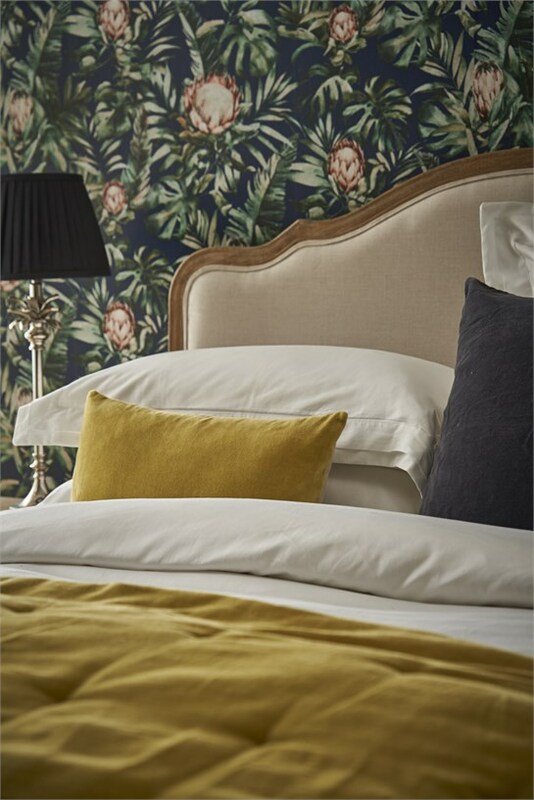 The classic aesthetic of crisp white sheets is always welcome in any room, and our Vienna Hotel Collection Bed Linen offers hotel luxe in abundance. With it’s 600 thread count, Vienna will envelop you in opulent bliss and make the accent colours of the cushions and feature wall pop. Lighting is important and the general rule of thumb is that you need more than one light source in a room, so extend your layering to include lighting too. Lamps provide soft, localised lighting and our Cecilia Lamp is the perfect bedside table accompaniment. Contemporary and classic in design, featuring a palm tree base and sophisticated pleated, black shade.